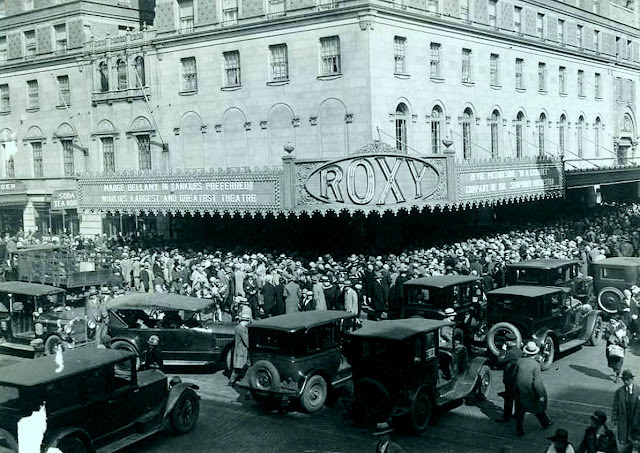 NEW YORK TOURS BY GARY : The Roxy Theater, one of New York City's greatest lost palaces. This is the late, great, much missed largest theater in the world (for a while), birth place of what became the Rockettes and "The Cathedral of the Motion Picture". The 5,920 seat Roxy Theatre. This, by the way is the opening of this palace, March 11, 1927 and this is also the north east corner of 50th street and 7th Avenue. The idea for the largest motion picture theater in the world was brain child of a movie producer named Herbert Lubin. Mr. Lubin wanted to build the largest and most luxurious house in New York City. The Times Square area saw a good deal of movie palace construction in the late teens and early 20's. These were lavish, overblown and beautiful houses catering to audiences that wanted to be entertained in a luxurious environment. With one of the biggest stages ever built for a theater on Broadway, The Strand Theater opened in 1914. 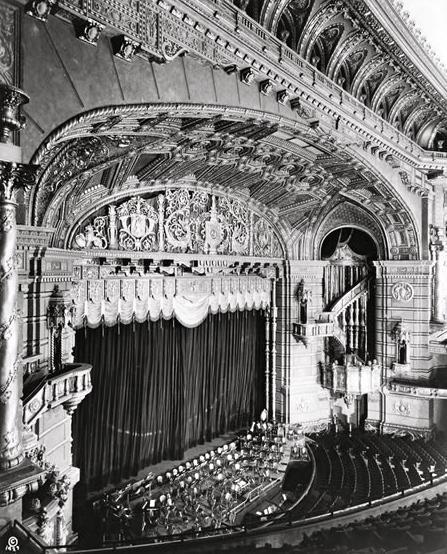 At 2989 seats this was one of the earliest movie palaces to hit Broadway, Broadway at 47th street to be specific. Only five years later The Capitol opened in 1919 on 50th street and Broadway at 5230 seats. Both of these theaters were designed by my favorite architect Thomas Lamb. The movie and stage show combination lasted at these theaters until the early 50's with a few years during the depression that saw no action on those big stages. The shows may have stopped for a while but rest assured, the mighty Wurlitzer organs rose from the depths of their pits to entertain between pictures. The competition was fierce, each theater had to be the biggest and the best. This is a color rendering done by the decorating firm, The Rambusch Decorating Company, in conjunction with the Roxy's architect Walter Ahlschlager, giving those involved an idea what the finished product would look like. In the days before computer rendering, an oil painting would have to suffice. The name "Roxy" was the preferred nickname of Samuel Rothafel. Born in Brooklyn but raised in Minnesota, this former Marine became the showman of the 1920's. He successfully combined motion pictures with vaudeville. He moved to New York City and worked his magic first at the Regent Theater in Harlem. He then moves down to the Times Square area where he performs his wonders at the old Rialto, The Rivoli, The Strand and The Capitol. His shows are so successful that he eventually gets his own radio show. Broadcasting from the Capitol Theater, Roxy has an audience of over 5 million and receives thousands of fan letters a week. After so much success with other people's theaters, it was eventually time for Roxy to have his own. When Roxy did get his own theater, it was the biggest. Everything about the theater was big. 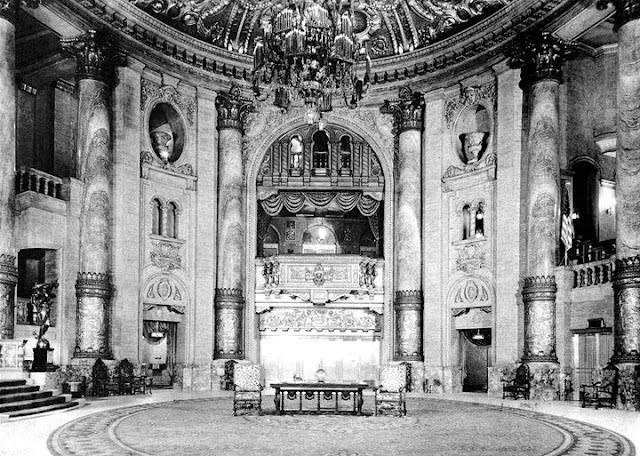 During the silent era it was not un-common for a big palace to have an orchestra play along with the picture in addition to the stage show. In this case the orchestra was a 110 person affair. This is a shot from house left looking down at the orchestra which has risen up from it's depths below to stage level. 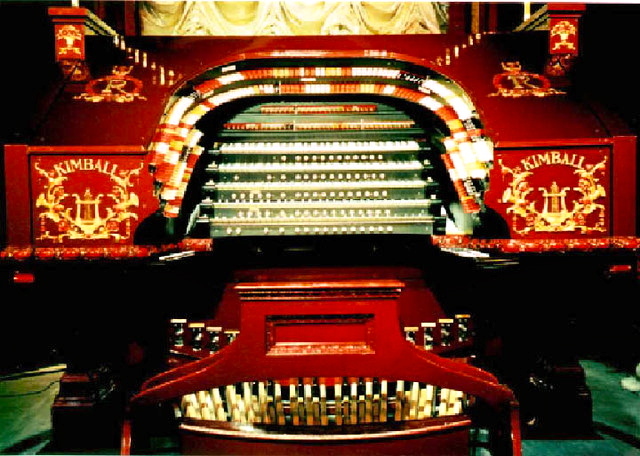 The largest Kimball organ ever constructed was operated by three consoles rising in the front of the pit. 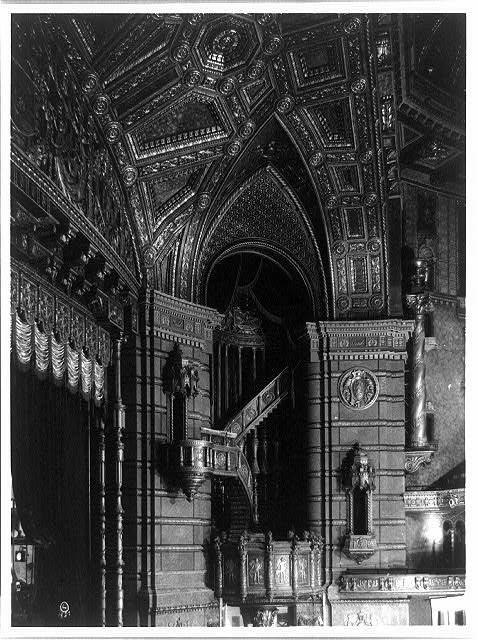 With the pulpits on either side of the proscenium arch, you can see why this house was referred to as "the cathedral of the motion picture". The balcony was very step indeed. The auditorium was on the shallow side and the stage was oddly shaped. The stage was a triangle but the center line of the stage did not meet up with the what I guess would be one of the angles that compose a triangle. That angle was off to the side. It was a real pain for set designers. The plan had been to build the big Roxy and then to build several other "satellite" Roxy's. One such satellite was begun but due to cost overruns and escalating costs with the main Roxy, the unfinished satellite theater was sold and completed by a different owner. The final cost of the Roxy was 12 million dollars. 12 million dollars that is. That figure put the idea of satellite Roxy's on a back burner so far back it might as well have been Cleveland. Only one of the satellites was under way and that had to be sold to finish the big Roxy. The Roxy was staffed by a myriad of professionals all out to produce the biggest and best stage shows. In addition to the master showman, there was producer Leon Leonidoff, choreographer Russell Markert, and conductor Erno Rapee. Almost every week the show was changed (along with the picture) and a new show was produced by Roxy and his producer Leonidoff. Choreographer Russell Markert came east from the Great Plains with his Missouri Rockets, a line of precision, high kicking dancers. He eventually made it all the way to New York and to Roxy and the Roxy were the Missouri Rockets became the Roxyettes. 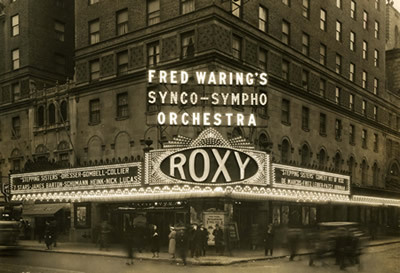 They joined the Roxy ballet company, the male chorus and lavish support facilities which included five floors of private and chorus dressing rooms, huge rehearsal rooms, a costume department, dry-cleaning and laundry rooms, a barber shop and hairdresser, a completely equipped infirmary, dining room, and a menagerie for show animals. There were also private screening room seating 100, as well as a cafeteria, gymnasium, billiard room, nap room, library and showers. This is the view from the stage looking towards house left over the orchestra pit which looks like it might be at the height at which it would have been in to play for the feature picture. The organ consoles are visible at the downstage area of the pit. Among the many innovations at the Roxy, the projection booth was placed in a cut in the center of the balcony. This allowed for a straight on throw from the booth, instead of the typical angle from a booth all the way up at the back of the balcony. The stage was very wide; and even with it's two stage elevators it was very shallow. I love this picture. It is a very full orchestra pit all the way up to "overture level". Roxy had begun what became a successful radio program on N.B.C. while he was at the Capitol and he carried the show over to his new theater. Another feature of this palace was the radio studio from which "Roxy and his gang" would broadcast from. This made the Roxy Theater even more popular and known nation wide. During the construction period, costs went spiraling out of control. The man behind this idea, Herbert Lubin, was $2.5 million over budget and near bankruptcy, sold his controlling interest a week before the theater opened to movie mogul and theater owner William Fox for $5 million. This ended the idea or hopes for the "satellite Roxy's" to be built around New York. However, construction had begun on one satellite theater and was almost finished but cash was needed to complete "the cathedral". 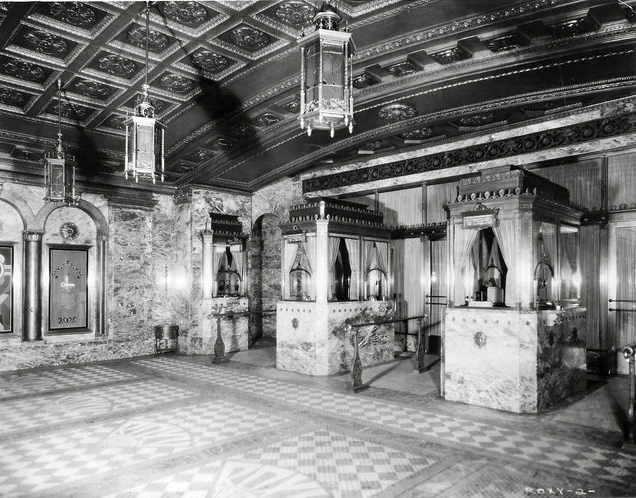 This theater was sold to Warner Brothers who completed it and opened it as the Warner Beacon in 1929. At 3,154 seats The Beacon, as it is known today, was the largest movie palace left in Manhattan until movies were no longer shown there as of 1986. It was designed by the same architect as the Roxy, Walter W. Ahlschlager. This is the Grand Rotunda at the Roxy. It contained it's very own Kimball organ (to entertain patrons who were waiting for the next show) and the largest oval rug in the world. Oval, not square or rectangle, but oval. 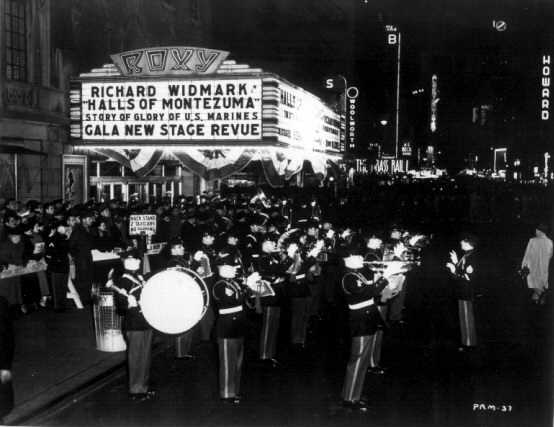 When the Roxy Midway, as it was to be called, was sold to the Warner Brothers, it was partially completed. The framework was in place and theater was physically laid out; the stage, for example is set into a triangle the same exact way the stage at the Roxy was except not as big. It was still wide and shallow and looking in at the loading door on Amsterdam Avenue you are looking almost straight into the house. The auditorium at the Beacon had not yet decorated. Since was no longer going to be part of that Roxy Gang, alterations were made to the design of the auditorium so it looks nothing like the Roxy. The inner lobby was finished however and it is a 1/4 scale version of the "Grand Rotunda" at the Roxy. This is the outer lobby and box office area of the Roxy. The outer lobby and box office area and, I believe, all or part of the Grand Rotunda were constructed within the Hotel Taft structure. That hotel was built with the entrance to the Roxy on it's south eastern corner, 50th and Seventh Avenue. A very similar arrangement to the Beacon hotel and the Roxy Midway (now the Beacon Theater). Note the marble floor with the Roxy logo inlaid. This area is now occupied by "America's Largest Friday's". Now there is an achievement. This is the same area as pictured below but with people in it. That is a Roxy usher standing at attention on the right. Cole Porter was right when he wrote the lyrics for "You're The Top" , those are some nice pants on that Roxy usher. 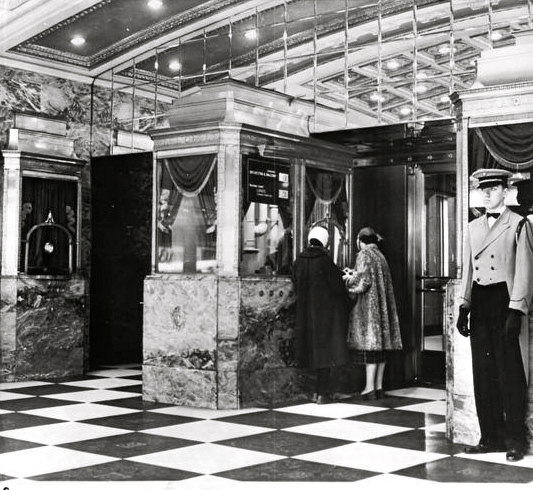 It appears that this is a later photo of the outer / box office lobby. The floor has been altered and what looks like a panel of mirrors have replaced the curtained transoms just above the ticket booths. 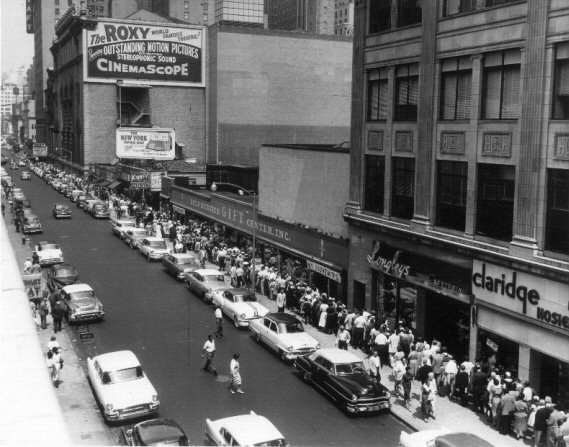 This is a line heading to the Roxy and all that this "World Famous Theater" showing only "Outstanding Motion Pictures in Stereophonic Sound and in CinemaScope". This is obviously the 1950's and if I remember correctly, this is a line to get into see the first movie in CinemaScope "The Robe" starring Victor Mature. In the old days children, a big picture would open at a handful of theaters. This may have been the only theater in Manhattan, for example, that this picture would have played in before moving on to neighborhood or second run houses. You would think that with a line like this that the Roxy was forever in the black and reaping in the dough. Not so, as the theater suffered dramatically in it's early years. 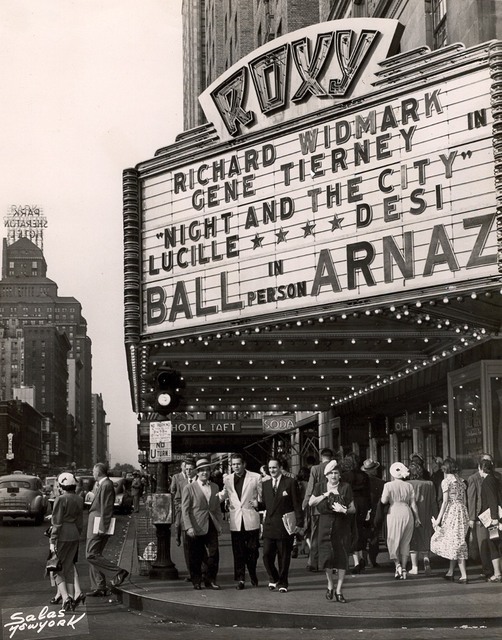 After William Fox bought out the nearly bankrupt Herbert Lubin, The Roxy was forced to show some very inferior Fox products, movies that would not put them in seats. It was not until 1942, ten years after Roxy's departure from his beloved cathedral that things started to turn around for the big house. A. J. Balaban, co-founder of the Balaban & Katz theater chain of Chicago, began nearly a ten year term as Executive Director of the Roxy. He had been retired from the business but coaxed into the job by Spyros Skouras, the head of the Roxy's parent company National Theatres, as well as 20th Century-Fox Studios. Now superior 20th Century -Fox product would open at the Roxy. Mr. Balaban also turned his attention to the stage shows presented at the Roxy. The Roxy held on to the movie and stage show combination long after most theaters discontinued the practice. In addition to installing ice on the stage Mr. Balaban would engage popular acts such as The Nicholas Brothers, Milton Berle, Cab Calloway and "The Poet of the Piano" Carmen Cavallaro. This is a photo of one Mr. Balaban's more interesting engagements. 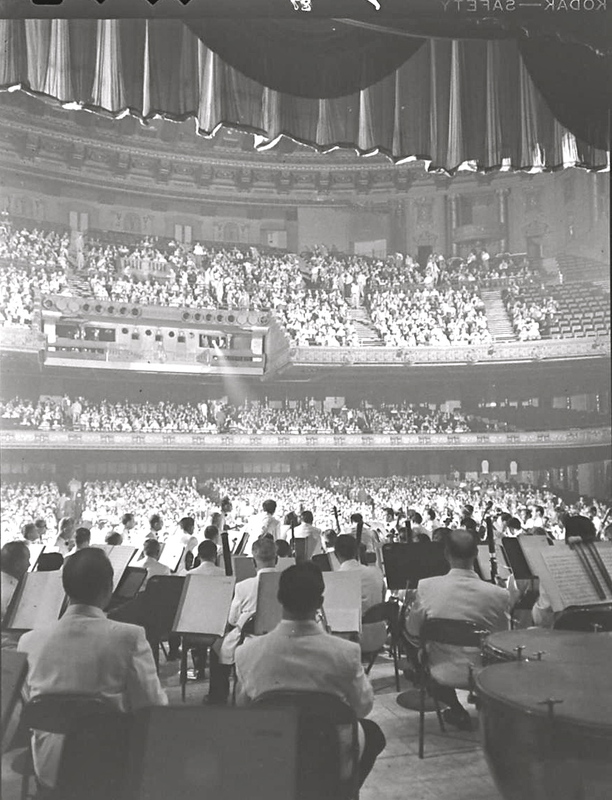 For two weeks in September of 1950, the New York Philharmonic along with soprano Eileen Farrell, were the show. Four times a day between showings of the 20th Century Fox feature, The Black Rose starring Orson Welles and Tyrone Power. The orchestra appears to be on the pit lift which looks as if it is at stage level. Except for a few empty rows on the sides of the balcony and loge, the house looks pretty full. This photo affords a great view of how and where the projection booth was situated. This all star blockbuster opened in December of 1950. Big openings were not just the realm of Hollywood. Mr. Balaban knew how to throw a premiere. After Roxy left, he went over to work on the opening of Radio City Music Hall. He took his production staff with when he headed east to 6th Avenue. 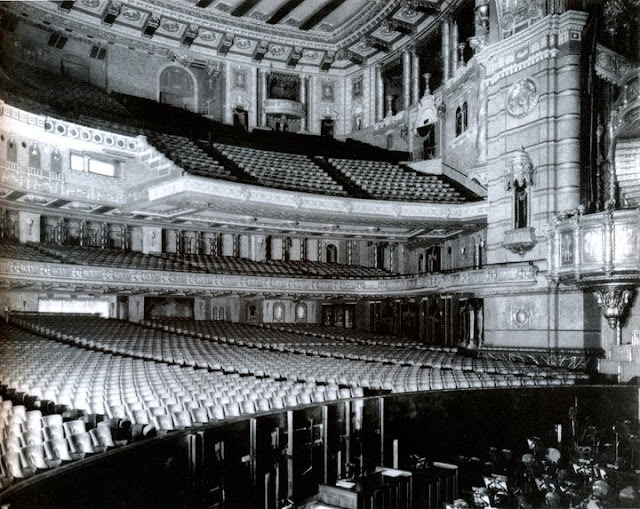 Originally planned to be called The International Music Hall, Radio City Music Hall opened to the public on December 27, 1932 with a huge stage show featuring Ray Bolger and Martha Graham. The opening was meant to be a return to high-class vaudeville. The new format was not a success. The program was incredibly long and individual acts were lost in this enormous very deep (as opposed to the shallow more intimate Roxy) hall. 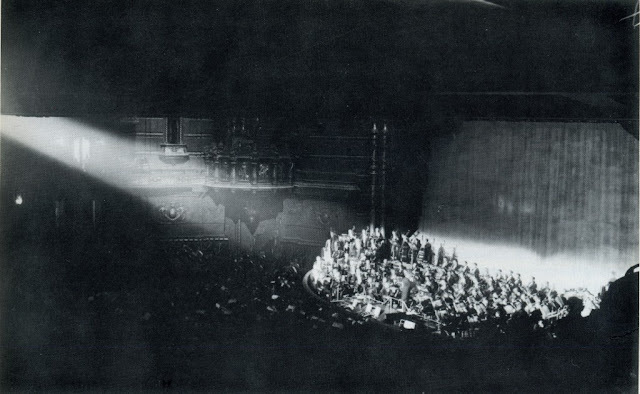 On January 11, 1933, the Music Hall converted to the then familiar format of a feature film with a spectacular stage show perfected by Rothafel and produced by Leon Leonidoff at the Roxy Theatre. It was this production staff that left a legacy that includes the Radio City Music Hall Christmas show. 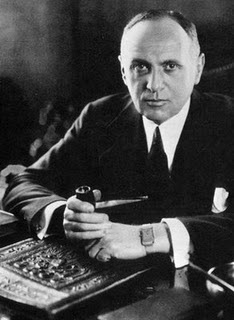 Musical Director Erno Rappe worked continuously that first year. He also drove the Radio City Music Hall orchestra with one iron fist holding the baton and the other holding a bull whip. A story handed down to me by my father about Rappe is when asked for a day off from one of the pit musicians who had been working for almost a year without a break, Rappe replied "You can take a week off, you can take a month off, but if you miss one day of work you're fired". In 1950, CBS asked Lucille Ball to take her popular radio show My Favorite Husband to television. She saw this possible television show as a great opportunity to work with Desi Arnaz to whom she had been married to since 1940. It would keep them both in Hollywood and perhaps save their shaky marriage. Lucy insisted that Desi play her husband. CBS was reluctant because Arnaz was Cuban. Network executives believed that audiences would not accept the marriage between an all-American girl and a Latin man. To prove CBS wrong, the couple developed a vaudeville act, written by Bob Caroll and Madeline Pugh, writers on the My Favorite Husband program who went on to write (or be part of the team that wrote) every I Love Lucy episode. They took this act on the road with Arnaz's orchestra, playing the big picture houses as the stage show. The act was a hit and convinced CBS executives that a Ball-Arnaz pairing would be a worthwhile venture. One of the stops on this tour was The Roxy, obviously. In fact, that's Desi in the white blazer under the marquee. Desi was appearing with his orchestra here at the Roxy in 1940 when Lucy came east from Hollywood. On November 30th 1940, Lucy and Desi went to Connecticut (there was no waiting period once you had a marriage license) got married and headed back to New York where she was introduced as Mrs. Desi Arnaz on stage at the Roxy. This is the center console of the Roxy Theater Kimball Organ. When Rothafel moved over to the Radio City Music Hall, the new Roxy management decided to extend the stage apron out over the orchestra pit. When this architectural miscarriage was committed, not only was the pit elevator immobilized, this act of vandalism left the consoles entombed in the basement. 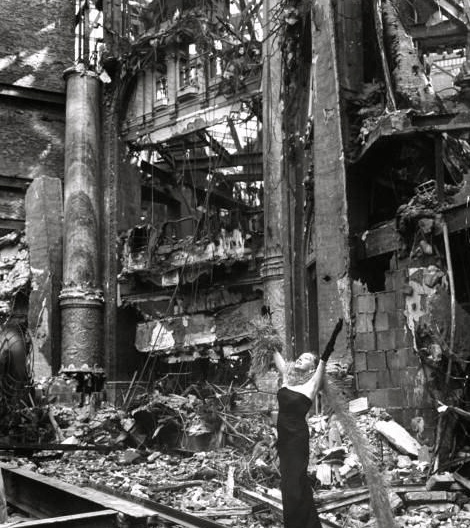 In addition, New York City fire codes required that the fireproofing between the house and the stage go up to the apron line. To do this, the massive organ pipes behind grilles on either side of the proscenium had to be walled up behind cinder blocks. A valiant effort to save the organ was made. The new management team talked about relocating the pipework. The Kimball people suggested that all the pipework be placed on one side of the auditorium. An estimate was obtained but the Roxy management balked at the cost of the work so the organ fell silent and the three consoles were moved to a warehouse. Then came the happy order to move the master console from the warehouse back to the theater. 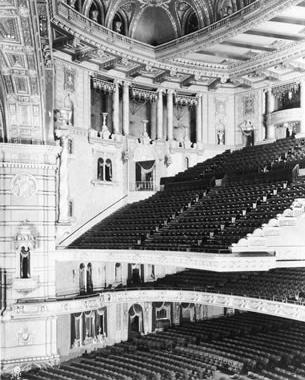 When the console arrived, it was placed up in a little balcony on the left side of the proscenium, where it remained until the early 1950's. The organ had to be amplified due the cinder blocking. So the worst possible amplification system was employed; the organ sounded strangely muffled as it was amplified through the house public address system. The distortion and limited frequency response of the PA system. In addition, this system could hardly do justice to the big Kimball sound... but at least it was organ music. This is the death of The Roxy. The big house closed on March 30th 1960 and demolition begun not long after. 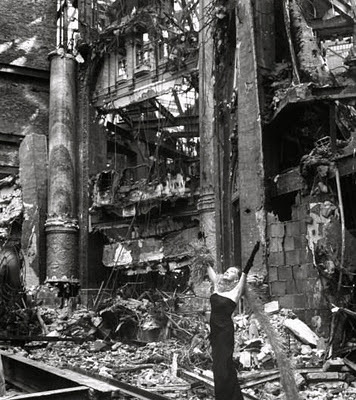 This is a picture of Gloria Swanson standing in the rubble of what appears to be the Grand Rotunda. She was there at the beginning, her picture The Love of Sunya opened the cathedral so it is fitting that she is there at the end. As I have said, everything about this place was over-sized. The tuned tubular bells, the longest at 21 feet and so large they had to be installed while the house was under construction, fell victim to the wrecking ball. Not much could be recycled, except for part of the organ and the center console, which is now in Las Vegas. Once the rubble was cleared, a nondescript office building rose in it's place. As for Roxy, the master showman, he passed away in 1936. His magic all used up, he could not save the gigantic Mastbaum Theater in Philadelphia. The man who helped move movies out of the nickelodeons, who created a special atmosphere in every theater that he touched, the man who told the New York Central Railroad that their 20th Century Limited should have a red carpet rolled out to meet the train both coming in and going out (they listened), faded into the history books of show business. This photo, the inspiration for the musical Follies, ends my Roxy revere. So sad. Just curious. Didf the sculptor, Rene Paul Chambellan, of Cliffside Park, NJ, and designer of several sculptures in Rockefeller Center, have anything to do with the sculptures, doors, etc. of the Roxy? Thank you for the history! The Roxy Theater was not part of Rockefeller Center but I went back to various books to see if I could find him in any index or even any kind of mention. I did not find him listed as having had anything to do with the Roxy, and we are talking about the original Roxy on 7th Avenue and 50th Street. Rene Paul Chambellan had worked with Harvey Wiley Corbett on various projects outside of Rockefeller Center as well as Raymond Hood, the lead architect on the project. Chambellan's style was more Art Deco (or as I saw it written somewhere "Greco Deco") and not really in line stylistically with what was done for the Roxy. And thank you for reading. I really enjoyed this article, especially since I'm new to theatre and cinema history research. Are there any particular books regarding theatre or cinema history that you find are worth reading to help increase one's knowledge? Also, do you have a high resolution image of Gloria Swanson standing in the rubble? I wanted to frame this and another photo of the Roxy to put on my wall. Thanks! Thank you for your comments. In thinking about your question I came to the realization that in terms of the theater architects there are only chapters within books that cover these people but just skim the surface. For example, there was never any mention that Thomas Lamb's second wife sold off what ever she could of his work as soon as he passed away. So to answer your question, the best book is The Best Remaining Seats (AKA - The Golden Age of the Movie Palace) By Ben M. Hall. Mr. Hall was the godfather of theater preservation. The other good one is American Picture Palaces by David Naylor. Probably the best book about how exhibition really changed how movies were made is American Showman by Ross Melnick. It is a bio of Samuel Rothafel, who was better known as Roxy. As for movie history, there have been some incredible books written about specific people in the industry. Goldwyn by A. Scott Berg, Victor Flemming An American Master by Michael Sragow, An Empire of Their Own - How The Jews Invented Hollywood and City of Nets by Otto Friedrich are incredible books. I hope this helps. As a child I found a grand book on The Roxy. This was right around the time when "Nostalgia" was the craze (1969,70) and that theater and all the photos - I think there is one with Gloria Swanson - have haunted me ever since. Thanks for this.